IIt took the Gladstone Gladiators about five minutes to drain most of the suspense out of Wednesday's Tri-Valley Conference opener against the Estacada Rangers. The Gladiators reeled off the game's first 15 points and never looked back, breezing to a 65-38 rout over the Rangers in a game that was all but decided before the end of the first half at Gladstone High School. Gladstone's Jude Ashpole scored eight of his team-high 13 points in the first quarter and Thomas Tacha added 10 points to pace a balanced attack that carried the Gladiators (10-5, 1-0 Tri-Valley) to their fifth win in six games. Calvin Dryden led all scorers with 20 points for the Rangers (3-12, 0-1), who got another 10 points from Nick Keller and six from Cody Syring. 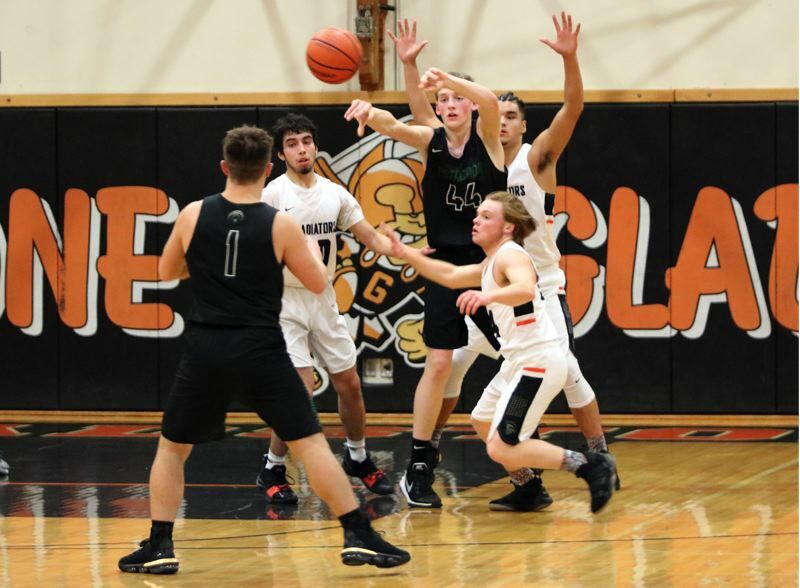 For Gladstone, Wednesday's win was a significant first step in the Gladiators' quest to claim a sixth consecutive Tri-Valley title and third straight outright league championship. "Something we've been stressing in practice is that from the get-go, we've got to play hard, play up-tempo, attack the rim, and play with confidence," Gladiators coach Cody Aker said. "In some of our non-league games, we were slow, methodical, and we'd find ourselves down by four to six points instead of being up four to six. "So, it was good to have that showing right off the opening tip." Gladstone scored on seven of its first nine possessions, going 6 for 13 from the field, including Damien Zaines transition lay-up off a steal that gave the Gladiators a 15-0 lead with 1:42 to play in the first quarter. At the other end of the court, Estacada came away empty on its first eight possessions, going 0 for 4 from the field with two offensive rebounds and six turnovers. "We wanted to see the tone defensively in our first league game and make it known that we weren't going to let up," said Zaines, the Glads' senior point guard. "It's one shot, box out, rebound, and that's it. We wanted to limit their possessions and just 'D-up.'" The game plan was for the Gladiators to force the action on defense, not sit back and allow the Rangers to swing the ball from one side of the court to the other and eat clock. "Estacada can be very deliberate and smart on the offensive end, so the concern was they would force their tempo and bleed some clock," Aker said. "That was the big concern -- them playing their tempo versus us doing what we wanted to do." Estacada got a basket from Dryden and two from Keller in the closing 1:22 of the first quarter, but still trailed 21-6 heading into the second. The Rangers twice cut the lead to 10, first when Keller hit a baseline jumper to make it 25-15, and again when Syring knocked down a 3-pointer from the left wing to make it 28-18 with 3:57 remaining in the half. Gladstone used a 5-0 run in the final 3:09 of the half to take a 33-28 halftime lead, and then outscored the Rangers 16-11 in the third quarter to break the game wide open. "We weren't in our element today and things got out of hand in the first quarter," Keller said. "That's what let us down. "We watched film on Gladstone all week and our game plan was to just come play our game and not play scared. We have a lot of young guys and I think what hurt us was we were a little nervous and a little impatient." Only three players scored for the Rangers, who shot 40 percent (16 for 40) from the field, 26.7 percent (4 for 15) from beyond the arc, and 50 percent (2 for 4) at the free-throw line. "Gladstone hit us with a big wave, which we knew they were capable of, and we got down," Rangers coach Kelly Norman said. "We fought back and we played really hard, but you can't spot a really good team 15 points in the first quarter. "They hit some shot and we had to make some adjustments. You know, we had some open looks and didn't make them, they hit theirs, and then there were a couple of turnovers and it just snowballed." Said Dryden: "When we get it going, you can feel the energy, but we got started too late. We were looking to start out strong, but we still build on this and keep improving." Gladstone's Drew Pulsipher scored nine points, Jackson Simmons had eight, and Jeremy DeVoe, Matthew Lehrbach, and Zaines had seven each for the Gladiators, who shot 41.2 percent (21 for 51) from the field with seven 3-pointers. "We come out here and try to give 110 percent every time," Zaines said. "We just try to do what our coach draws up on the board, execute it to the best of our ability, and hope that the game turns out the way that it did tonight. "Playing with that kind of lead makes it easier, but at the same time, it's like a gift and a curse. There's that gap and you think you get a break, but there are no breaks in this game. You've 110 percent all game. If you need a break, we've got guys on the bench ready to come in and do whatever we need them to do. "I thought we were pretty solid tonight. Really, really solid." Estacada (38) -- Calvin Dryden 20, Keller 12, Syring 6, Hagel, Lang, McDonald, Schaffer, Snyder, Haefs, Crombie. Gladstone (65) -- Jude Ashpole 13, Tacha 10, Zaines 7, Pulsipher 9, Simmons 8, Hill 2, Lehrbach 7, DeVoe 7, Bulisco 2, Kuhn, Broomfield, Peiffer.